1. Get excited (not nervous)! After a long Winter, the arrival of green grass and flowers is enough to want to make you giggle as you walk down the street. Having a summer party is something you want to be excited about – not nervous about! We can definitely help with that. If you are relaxed – then everyone is relaxed – and that is the secret of entertaining. Now that you are relaxed and excited about your party - do the same thing for your guests. Welcoming cocktails are a wonderful way to greet your guests and make them feel comfortable right away. In the summer – there are so many refreshing and thirst quenching drinks you could offer your guests. Lemonades of all kinds, fresh fruit spritzers, or perhaps a Blue Hawaiian cocktail with an umbrella? We have you covered here. We think it’s pretty cool that everyone at a party can share the same food experience. Whether it's a cocktail party, dinner party, or outdoor summer BBQ - the food is an amazingly important part of the experience. I mean, think about it, everyone is actually physically experiencing the same thing when they eat together. It is literally and figuratively a way to get inside (the hearts and stomachs!) of your guests. So if the food is amazing, fresh, and special – then that is how all of your guests will feel. The bounty of summer is both beautiful and delicious. While some may think it is corny to have games at an adult party, we know that everyone secretly (or not so secretly) loves activities at parties – even if they don’t participate in them. Having an activity for the extroverts is fun and gets people mingling and gives the quieter introverts something to watch! And they can be simple. Obvious outdoor games such as Bocce ball and croquet are classics (say no to the lawn darts!) And for the especially ambitious, scavenger hunts or brain teasers are another fun way to get people talking with one another and having fun. Part of the reason why many people don’t enjoy parties is getting trapped in ‘small talk’. Well – if you give your guests something to do – they will have no problem thinking about what to say. And this works with private parties as well as corporate parties. We are all relationship addicts – we sometimes just need a little push to get us to bond. This may seem like an obvious thing to do but it can be missed. And yes, your guests should also be thanking YOU for inviting them and hosting them at the party – but making sure that you take a moment to pause and thank your guests for coming and contributing to the party is important. Again – this can be as simple as just saying thank you with your goodbye or it can be as luxurious as a small tasty treat wrapped up for guests to enjoy on the way home or the next morning. The thank you works like the welcoming cocktail but in reverse. The cocktail made your guests feel welcome and comfortable and the thank you will make them feel special and will ensure that not only the party is remembered but that your relationship with them grows as well. And, isn’t that really the point of all parties? Luxury is not about a price point. Luxury is all about feeling. It’s how you are looked after and how you are served that makes you feel so wonderful. Thanks for reading! Be sure to like us on Facebook, follow us on Pinterest, and tell us about your favourite summer party and what made it so fantastic. We will share the memories and ideas here. 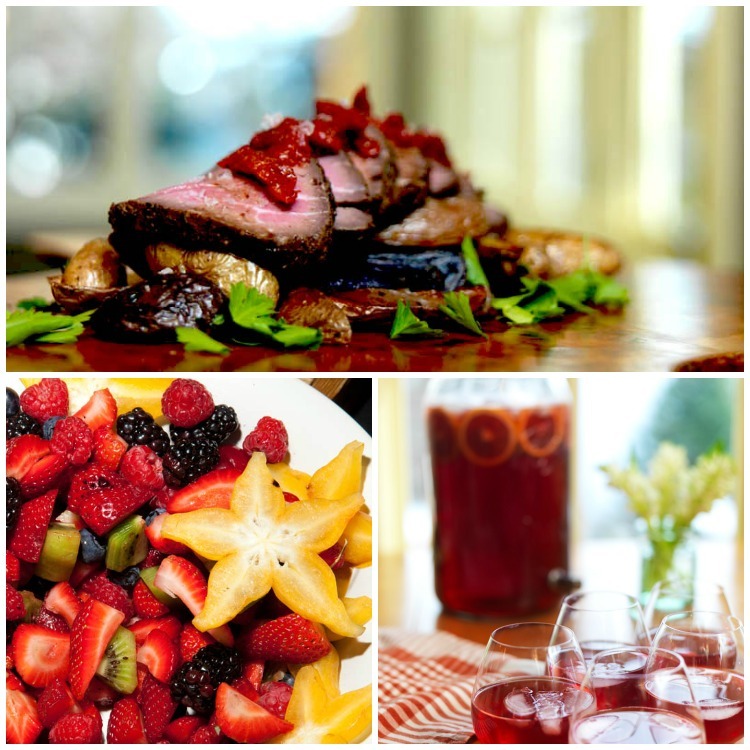 Grilled bison, fresh fruit salad, and cranberry lemonade. Newer PostDevour the difference! A new video about Devour Catering!